Taking stock of the back-and-forth battle to offer more beef, more bacon, more meats on fast-food sandwiches, we fully expect to one day see a chain debut a burger that is actually just an entire cow between two buns. (You heard it here first.) The latest in the war for beef-patty supremacy comes from Burger King, which yesterday rolled out its Big King XL sandwiches at participating locations nationwide. 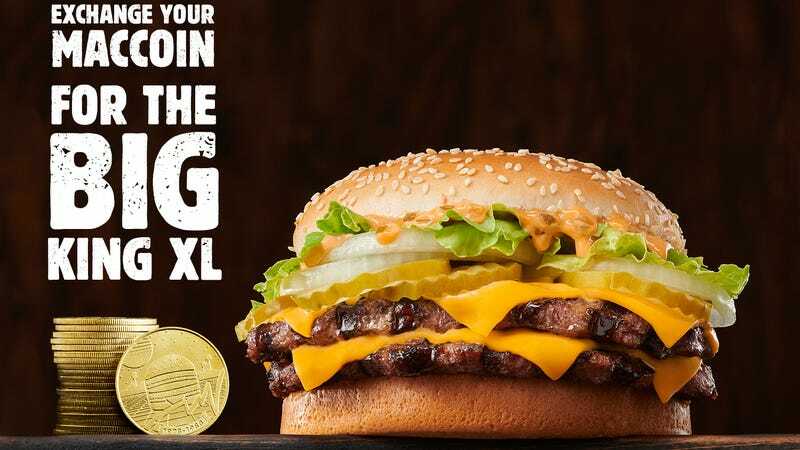 Further pushing the rivalry angle—because that’s all we expect from restaurant brands these days—BK says it will accept customers’ expired MacCoins as payment for Big King XLs. (McDonald’s gave out MacCoins last year for the 50th anniversary of the Big Mac, but they’ve since expired.) Whether BK’s new burger is any good, we’re a bit weary of the way fast-food brands have been constantly trolling each other. We get it, you’re competitors, but the shtick has run its course. Just tell us about the burgers.